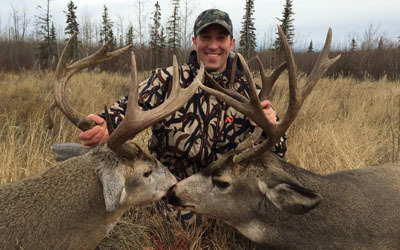 What do you get mule deer hunting with Mike's Outfitting? 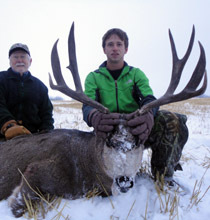 A guaranteed license in a trophy mule deer zone. No draw required. 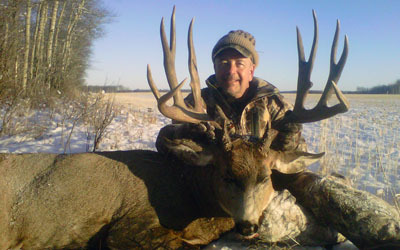 A 90-100% chance for a heavy 160 to 180 score buck. 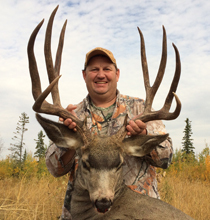 The possibility for a huge 180+ inch deer. Not physically demanding, low elevation, farmland hunt. 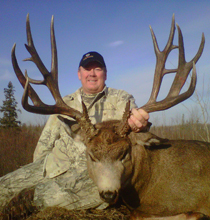 Alberta, Canada is one of the premiere spots in North America for trophy mule deer and we are in one of the best locations within Alberta. 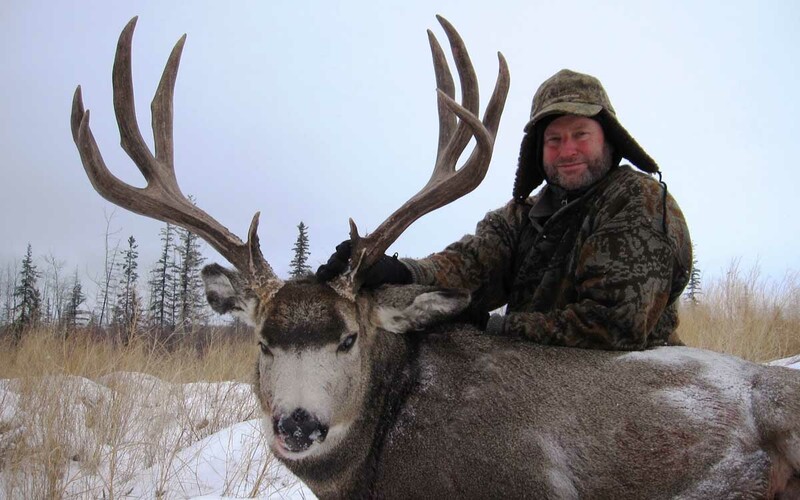 Our mule deer hunts take place in the Peace River region of the North West where mule deer are on a limited draw for resident hunters. We own the rights to some of the small number of outfitter tags. No draw needed, just book a hunt with us. 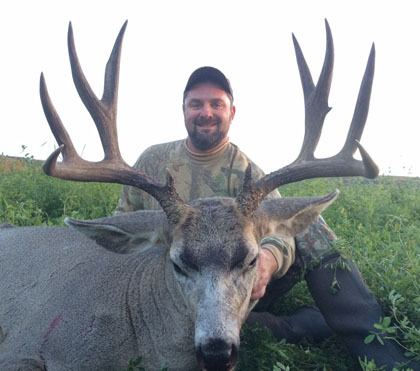 We run our mule deer hunts in September when the deer are in their bachelor groups and in November during the rut. We mainly hunt thousands of acres of private farmland. where resident hunters can also hunt but with the limited resident draw there are never many hunters. We do extensive August and early September scouting, finding and keeping track of as many big bucks as possible. We hunt the mule deer mainly by truck on the farm field roads, it is usually a physically easy hunt where you can see dozens of deer on a good day. On occasion we will sit field edges trying to take a specific buck or watching a doe group in the rut. The scouted out bucks that we don't kill in September usually go into hiding and then resurface in the November rut. The rut is also when new trophy deer that we've never seen show up. 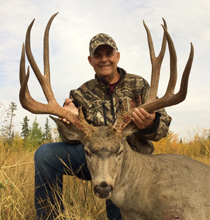 On both of these mule deer hunts success on a trophy deer is practically guaranteed, it is just a matter of how big he will be. 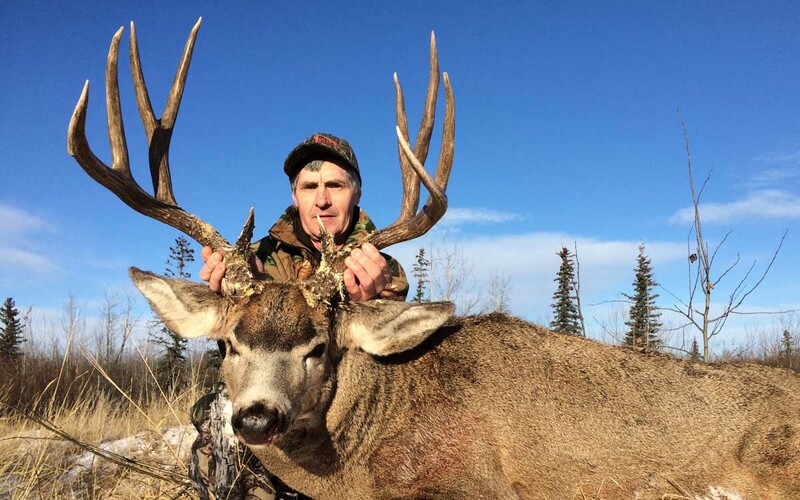 If you want to make sure you go home with a deer though we recommend that you shoot the first heavy, mature, 4x4, 165+ gross score buck that you see. With all the thick trees in our area you may not see that buck again and may not find anything larger. 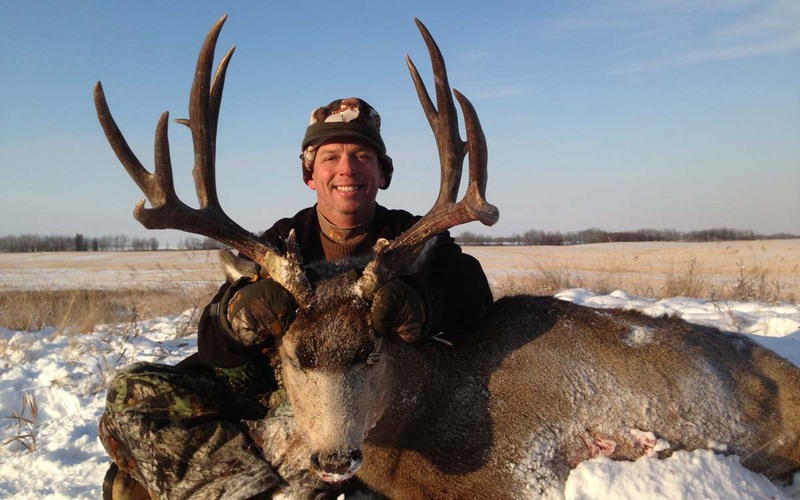 If you are looking for a 180 plus score deer, we have them, even some scoring over 190 but they are very tough to find, about a 10% to 50% chance on a 180+ depending on the year and the weather on your hunt. We always go after the biggest deer we can find though!. 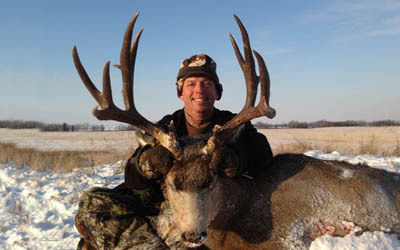 Mark Hampton's buck scoring just shy of 215! If you are looking for a outfitter to make your dreams come true, look no further!! Mike's outfitting made my dream come true again. The guides, lodging, food, and accommodations make you feel right at home. 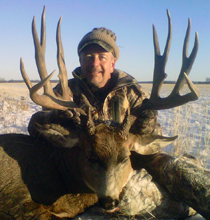 They all put a lot of effort and time into making your hunting trip a hunt of a life time. Mike's know BIG game. Saw many different bucks. So if they say "No that's not big enough", believe them. I could go on and on, can't say enough of the fabulous trips I have had so far with Mike. I am sure I will have many more. THANK YOU Mike, Jen, Kyle, Sam, Brooke, and Tyler aka Tyber for making my dreams come true. You have a FRIEND for life, not just a client. I had been planning a mule deer hunt for several years, not knowing where to go or what outfitter to choose! After extensive research I decided on Alberta as my destination and Mike’s Outfitting to guide my hunt. 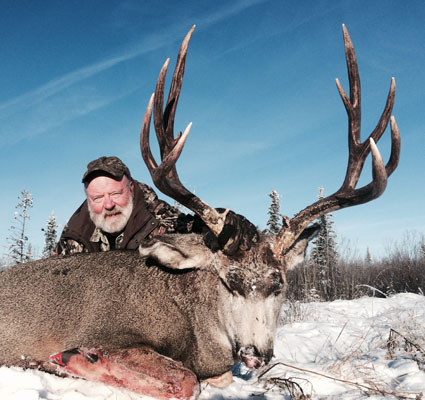 Mike’s operation is centered in a hunting mecca with a beautiful Canadian landscape in the backdrop! Mike is incredibly passionate about giving his hunters the best possible experience and opportunity to have a successful hunt! Hunting with Mike and Jen is like being with family; in fact Kyle, Sam, and Laverne as a team embody “family” and welcome you in to enjoy and share in the chase and celebration! I had a very successful hunt! 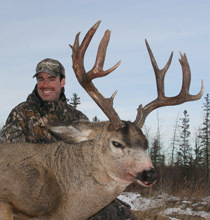 I left Alberta with two wonderful trophies and memories that I will enjoy for years to come!